Gilbert du Motier, the Marquis de Lafayette, is heralded in this country as a hero of the American Revolution, but this French-born aristocrat’s contributions to his own country’s history are less widely known here. Donald Miller’s well-researched biography, Lafayette, takes aim at this discrepancy by recounting Lafayette’s valorous life on both sides of the Atlantic. 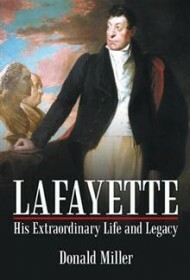 Born in 1757, Lafayette yearned for glory as a young boy. He spent his youth at Versailles, which Miller calls “the apex of exquisite tedium,” where he studied, joined an elite military corps and married into another wealthy, influential family. He became enthralled with the American cause of liberty and sailed for the colonies in 1777, where he provided essential funding and military support. Returning to France in 1781, Lafayette received a hero’s welcome and ascended the military ranks. Amid growing French unrest in 1789, he penned The Declaration of the Rights of Man and Citizen, which called for personal freedoms, and he was subsequently named vice president of the National Assembly and hailed as a champion of liberty. This adoration was short-lived. Viewed by certain factions as a defender of the monarchy, Lafayette was arrested in 1792 after Louis XVI was deposed, and he was imprisoned for over five years. Upon release, he remained active in French political life until his death in 1834. Miller valiantly leads a thorough charge through Lafayette’s life. A veteran nonfiction author and former newspaper editor, he writes clearly and logically. However, the sheer volume of information detailing Lafayette’s life from birth to grave can be overwhelming. Despite the excitement of the times, the narrative often falls flat, as Miller tends to simply recite details of Lafayette’s life instead of fully scrutinizing them. The author is at his best when he provides analysis, such as opining that Lafayette’s “weakness was a thirst for glory but none for power.” One wishes for more of such moments; nonetheless, readers interested in Lafayette will find a comprehensive account here.